Every so often we like to have fun with the cities and towns that appear in our Facebook Insights and Google Analytics. One town that has been appearing prominently in our Facebook page stats recently is Livingston. However, we have no idea which place called “Livingston” this actually is, so we will explore a few possibilities. Based on the demographics of our readers and Facebook fans, it’s probably in the U.S., and it is most likely Livingston, NJ, a town east of Newark along I-280, not far from New York City. Livingston is a medium-sized suburban town. Though its history dates back a long time (about 300 years), it was relatively sparse until automobiles and highways arrived in the 1920s. Notably, it is named for William Livingston, the first Governor of New Jersey. It is also near the Riker Hill fossil site, also known as Walter Kidde Dinosaur Park, a major paleontological site – I remember hearing about the “major dinosaur fossil site in New Jersey” a few times while growing up across the river in New York. It could be Livingston, California, a town along the Highway 99 corridor in the Central Valley, between Modesto and Merced. Like much of this part of the Central Valley, it is primarily an agricultural town. It could also be Livingston, Montana, a picturesque town along I-90 and US 191 north of Yellowstone National Park. 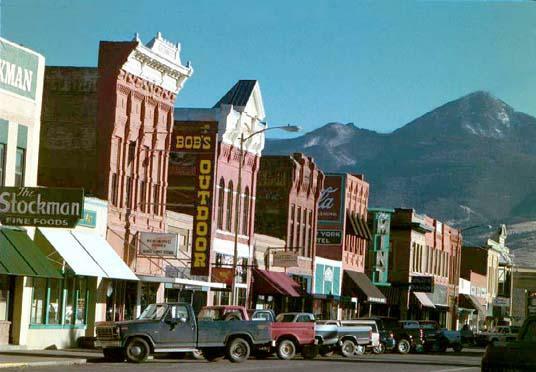 It has that classic “old US downtown” look with mountain ranges in the background. It also seems like a relatively prosperous town (much of its economy is related to tourism). As of this writing, however, it sounds like they are at the edge of this year’s intense flooding along rivers in the U.S. and the Yellowstone River is again above flood stage as of the writing of this article. We hope they stay safe and dry! In late May, flooding on the Yellowstone River closed parts of I-90 near Livingston. Livingston, NY is in the Hudson Valley and quite a ways north of New York City. It is considerably smaller than its counterparts in New Jersey, California and Montana. In the strange way that I remember such things, I am pretty sure I have been through the junction of US 9, NY 9H and NY 82 (and NY 23). Smaller yet is Livingston, Louisiana. It is along I-12 east of Baton Rouge. I mention it because it has a gravitational wave observatory. That is cool. Gravitational waves are theoretical ripples in the curvature of spacetime that propagate as a wave – a phenomenon predicted by Einstein’s theory of general relativity but never directly detected.